As a one-time Halo mega fan will tell you: Halo lives and dies by its multiplayer, its life after the reliably epic campaign is cleared on at least Heroic difficulty. Knowing this, it was quite a shock to learn earlier this year that Halo 5: Guardians – due out on Xbox One on October 27 – will not support split screen cooperative campaign play. Sure, it's a bummer to think that I won't be able to relive my foundational memories of the Halo series in this shiny new iteration. But after seeing it first hand, what developer 343 Industries has created in focusing on 100% online multiplayer is remarkable. Frankly, one new approach to online play made for the best time I've had playing Halo online since Invasion in Halo: Reach. Welcome to Warzone, the brand new player-versus-player-versus-environment-versus-player game mode that can be described as Halo's response to the League of Legends craze. Whether you're (somehow) new to the Halo series or haven't dove in since, say, Halo: Combat Evolved, this is probably where you'll live online when Halo 5 lands, and that's totally OK. In fact, I already prefer it. Warzone is all about the points, more specifically amassing match points at all costs while earning and spending your own requisition (or REQ) points to fund the coolest ways to – you guessed it – rake in more match points. The first 12-player team in this frantic 24-player game to collect 1,000 points wins. Match points are collected in several ways, letting players contribute to their team's success however fits them best. Downing enemy players and capturing strategic bases that bring players closer to accessing the enemy team's core in its home base is one way to earn points. Laying the hammer down on invasions of computer-controlled Covenant (fleshy aliens) and Promethean (robotic aliens) forces earns your team points, too. During my time trying out the mode at a recent press event, these two point-pillaging methods intersected on an almost predictable, but nevertheless reliably awesome, basis. Unless you're preparing a customized (but still slow as molasses) Scorpion tank for some replay-worthy displays of point collecting, you're never not in the action. Through this REQ system, which is the heart of the game's microtransaction hook, players can access increasingly powerful weapons, armor upgrades, vehicles and power-ups as a Warzone match plays out depending on the team's performance. Players spend these points on REQ cards containing said improvements, which are either earned through consistent play or purchased outright through packs. A persistent level-up system, unlocked partially through opening REQ card packs, allows you to access new and better items in future Warzone matches. During matches, what you're able to requisition depends on your team's per-game REQ level, which increases over the course of a match – faster if your team is hot. For instance, if I just pulled off a kill streak, I could call in either two new weapons and an overshield for two to three points a piece or a deadly Mantis rocket-firing robot for seven points. The meter then refills – again – based on performance. 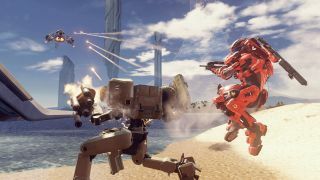 As Halo 5: Guardians executive producer Chris Lee tells me, Warzone simply wouldn't be possible without Microsoft's army of powerful cloud computing servers. It's the firm's Xbox Live Cloud Compute array of servers that powers all of the artificially intelligent enemies within Warzone, for one. "I think Warzone is the most ambitious thing that we've done," Lee says. "It was pulling in all of the elements of the sandbox together and it's a really unique challenge. To have those enemy AI, we need those dedicated servers to run the AI. We brought in all of these vehicles and variations on them, so you don't have one version of the Scorpion tank, you have the Oni Scorpion tank [too]." "So, we have all of this player customization coming into a single mode," Lee explains. "And we did that while making it the biggest multiplayer map size that we've ever had – three to four times bigger than anything we've ever done before. We really had to re-write major parts of the game engine and things like that just to make that game mode possible. I think that's the experiential place where you can see us pushing the boundaries in all directions the most." What the technical achievements translate to is an online experience that somehow facilitates both frenetic, squad-based play that rewards communication and teamwork meanwhile offering up less experienced or skilled players fun ways to contribute. For me, that means firing up the nearest vehicle I can find and causing as much damage as possible before I bite it. By no means does this mean that Halo 5 has lost the series's competitive edge. "We also have a meta level over multiplayer, we have Arena," Lee says, "which contrasts with Warzone and was built from the ground up to go back to the roots of Halo, the legacy of Halo – ultra-competitive. It's all about fair starts, the even playing field with the starting weapons, symmetrical maps. It's built from the ground up for e-sports and competitions as well." "That mode lets us engage fans who really want that traditional Arena experience," Lee says, briefly interrupted by cheers in the play area, "to put it in its own place. So, you can go and enjoy that or try Warzone – you have a lot of different options. We want to recognize and engage those gamers that want that competitive experience, we're not trying to solve that with Warzone." Arena is essentially the Halo experience that veterans of the series are likely salivating for, only more balanced this time around than possibly ever. Every stage that I was able to play on, in the standard deathmatch-style Slayer mode in Arena, had specific "power weapons" that only appeared in choice areas on a very announced timer. Touches like this give traditional Arena play a much more classic, American Gladiators feel that first-person shooters of the late '90s and early aughts – Quake, Unreal Tournament, even Halo – embodied so well. Now, coupled with baked-in rewind and replay tools in the game's Live Spectate Mode, not to mention Twitch access through the Halo Channel, Halo 5 appears well-equipped for the live streaming revolution we gamers have found ourselves in. Sure, Arena is designed at heart for the competitive – dare I say the word "e-sports" was thrown around a lot as I talked to folks that day – Halo player. But even that mode has some clever tools in place to keep things accessible, namely smarter matchmaking than before. According to Lee, Halo 5's competitive skill rating system is its improved means of determining your skill within Arena. The score is publicly visible and core to how you experience the mode. "[Competitive skill rating] helps us understand how skilled you are at the game and puts you in matches that are competitive for you," Lee explains. "We're trying to the eliminate the huge skill disparity in matches and having people go in and play someone that's way out of their league – out of their skill bracket." This is my least favorite part of first-person shooters: you jump into a match, and within seconds a Halo pro no-scopes you from across the map. Lee assures me that this scenario is something the team had in mind in divising its new matchmaking system. There are seven tiers for the combat skill rating system: bronze, iron, gold, platinum, diamond, onyx and Champion. You qualify over the course of 10 matches, Lee says. The system detects your skill and gives you your starting position in your skill bands. After that, you're told what skill you rank you fall into. All of this is 100% visible to players, and exists on a per-playlist basis. If you're really sharp at capture the flag, your rating for that mode might be iron versus your poor Slayer score of bronze. "It's really all about defining that skill value," Lee says, and he means it. "For the highest tier of skill, the Champions, we will take the top 200 players in the community. They'll be flagged as Champions. In addition to their Champion badge, like the other skill ratings, they will have a discrete skill number." "You'll actually be able to see, if I'm at 25," Lee explains, "how much more skilled is the 24th player and how much less skilled is the 26th player." Based on my chat with Lee, it's clear that 343 wants Halo 5 to succeed well beyond that first few months into and following the holidays. Naturally, multiplayer is key to that longevity, and not only does Halo 5 have it in spades, it's some of the best online shooter play I've enjoyed since the crazy robotics of Titanfall. Warzone's frenetic, massive battle scenes with Banshees roaring overhead, lasers and mortar fire are already calling to me. And Arena's laser focus on straight up competitive (but accessible) play looks well-positioned to keep the diehards intrigued for some time. Halo 5's campaign, which I was able to test as well, delivers some seriously set piece sci-fi moments – rocketing through an airlock from dead space into an alien ship? Check. But those will inevitably get stale. It's up to the explosive rounds of Warzone or crack shot kills of Arena to keep the players coming. And Halo 5 looks better set than any before it to deliver that and then some.